Following is the speech by the Financial Secretary, Mr Paul Chan, at the 11th Asian Financial Forum cocktail reception at the Hong Kong Convention and Exhibition Centre this evening (January 15). After an exhilarating and, no doubt, exhausting day dissecting Asian markets and China opportunities, tackling the global economy and the revolutionary impact of technology - I'm sure that I'm missing something here - in any case, after all that, I believe we could use something more than a final break for coffee and cookies. Which is why I'm delighted to welcome you to the Asian Financial Forum's cocktail reception. Your chance to put a pause on the day's stimulating intake and mingle with the good, the great and the promising all about you here this evening. Indeed, this year's Forum welcomes around 3 000 business leaders, government officials, investors, entrepreneurs, regulators, researchers, academics and students - all finance aficionados - from Hong Kong, the Mainland of China, throughout Asia and all over the world. It helps, of course, that Hong Kong is among the world's leading financial centres. That, by the way, is not my revealing bias, but the conclusion of the latest Global Financial Centres Index, which ranks Hong Kong first in Asia and third globally, just behind London and New York. The Index is hardly alone in spotlighting Hong Kong's business prowess. Last May, the International Institute for Management Development once again crowned Hong Kong the world's most competitive economy. It also ranked us top in financial efficiency. We attract attention and awards, business and investment for all the right reasons. Because Hong Kong thrives on openness, on the rule of law, the free flow of capital, goods, people and information, and last but not least the unique advantages under the "one country, two systems" arrangement. Over the years, and the decades, we have built a regulatory regime that is fair, transparent and fully aligned with international standards. 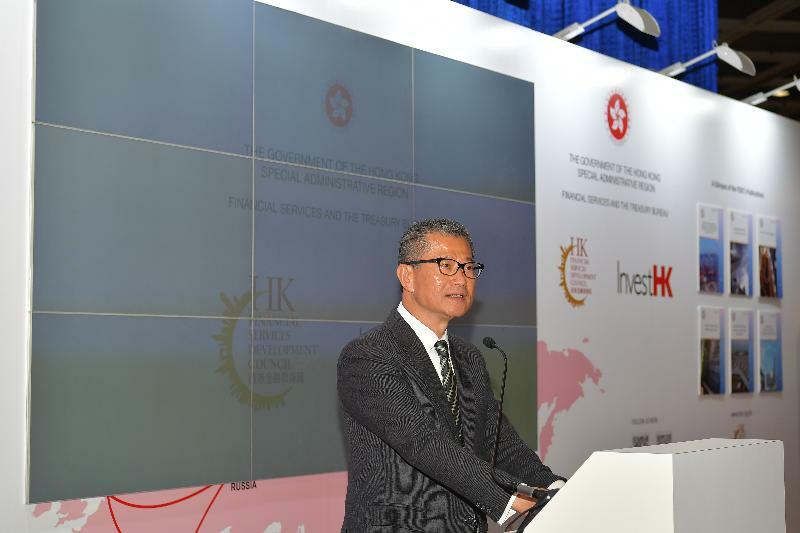 Hong Kong is endowed with the experience, expertise, international connections and deep liquidity to serve as the leading fundraising and financial management hub. It's no surprise, then, that our stock market has been among the top five globally for initial public offerings every year for the past 15 years. Hong Kong is also Asia's largest asset management centre. Let me add that funds sourced from non-Hong Kong investors account for more than 60 per cent of our fund-management business. As the unique two-way platform for overseas investors to tap into the Mainland markets and for Mainland investors and enterprises to "go global", there is much more on Hong Kong's horizon. Hong Kong has the world's largest offshore pool of Renminbi funds and provides a diversified range of Renminbi products and services. Coupled with the ever-deepening mutual access arrangements between the Hong Kong and the Mainland financial markets, Hong Kong has established itself as a leading global hub for offshore Renminbi business. Building on this and looking ahead, the Guangdong-Hong Kong-Macao Bay Area development and the far-reaching Belt and Road Initiative will offer even more opportunities in the coming decades. Ladies and gentlemen, I welcome you to partner with Hong Kong and use our outstanding platforms. I also wish you a fruitful participation in the Asian Financial Forum and the best of business throughout 2018. Thank you very much.